Kanye West is a cultural phenom. The boisterous producer turned rapper turned designer has thrown himself into a number of projects with the end result usually being a polarizing offering that garners as much attention as possible – just listen to his music, or watch videos of his subsequent tours, or look at his apparel moves from Nike to adidas. Today we’re looking back at the complete history of Yeezy sneaker models starting with the first Nike Air Yeezy collaboration back in Spring 2009 all the way up until this year’s holiday release slate. Check out a full rundown of every Yeezy sneaker release by Kanye West in collaboration with Nike and adidas below and be sure to head over to Stadium Goods to find your favorite pair today. Kanye West was one of the biggest recording artists in the world by 2009. He’d experimented with a completely different sound on his stadium-booming Graduation album that saw his Glow In The Dark World Tour hit a multitude of stadiums, but somehow in the sneaker world, the focus remained on Kanye’s shoes and now the elaborate mountain-inspired stage. His Yeezys had been triumphantly announced during his emotional performance of ‘Hey Mama’ a the Grammys a year prior and only fueled internet rumores of a potential release. We finally got just that on April 4th, 2009 with the Nike Air Yeezy “Zen Grey” dropping at retailers in incredibly limited numbers. The unique high-top construction championed its own unique print – a futuristic pattern of ‘Ys’ throughout the mudguard and mid-foot strap while luxurious touches of suede and micro-perforated leather showcased just how premium a Nike model could be. Some said the Yeezy pattern was an homage to the Air Jordan 3’s elephant print, which would make sense given that the shoe used Tinker Hatfield’s creation as the blueprint. The Air Jordan 3’s midsole and outsole unit finished off this Yeezy must-have with a glow in the dark touch. 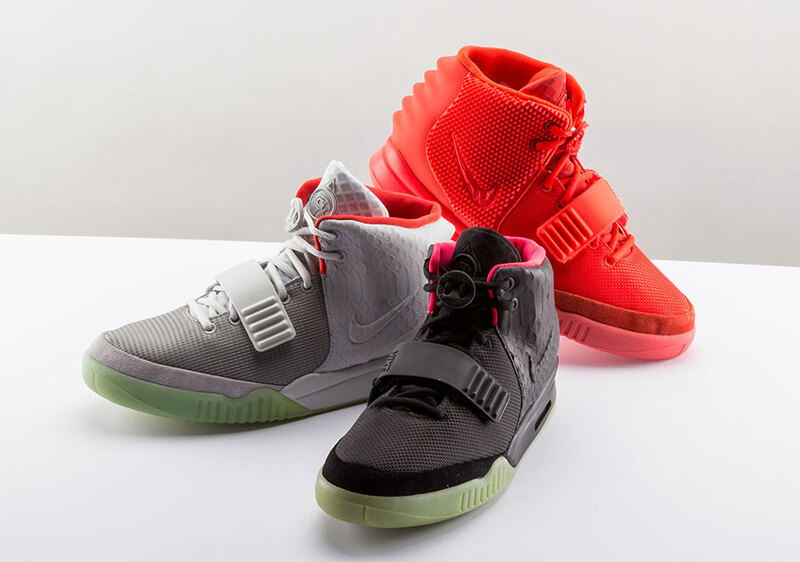 The Yeezy shoes by Nike influenced the sneaker world for years to come thanks to its head-turning design and limited availability. But perhaps just as influential was the “Blink” colorway. The fierce black upper featured a lush dark grey suede while the ‘Y’ print was featured on both the mid-foot strap and heel for a complimentary aesthetic. The vibrant pink lining paid homage to the neon lights seen throughout the Glow In The Dark Tour while a white outsole hid a glow-in-the-dark feature. We’d see numerous copies of this colorway in the years that followed, but there’s nothing like the original. The trio of summertime Nike Air Yeezy releases ended with this outlier, the Nike Air Yeezy “Net”, a premium lifestyle colorway that featured a base of buttery micro-perforated tan leather while the infamous ‘Y’ elephant print motif was almost completely abandoned. You can still see traces of it on the grey suede toebox, but the midfoot strap featured a head-turning patent leather tan that was just a few shades lighter to match the base. Kanye’s love of pastel shades influenced the lining with two different pink accents adding a change of pace. While the “Zen Grey” and “Blink” colorways would be referenced in the follow-ups, this look would be exclusive to Kanye and Nike’s first silhouette together. It was nearly three years after the debut of the Nike Air Yeezy, and it seemed like a lifetime ago that Kanye and Nike Sportswear had collaborated on a model. Kanye had his fair share of things to deal with, from his media fallout at the VMAs with Taylor Swift to the redemption that was My Beautiful Dark Twisted Fantasy. Kanye and Jay-Z highlighted a summer tour with Watch The Thrown that had Ye rocking leather kilts (not a dress) and early samples of the Nike Air Yeezy 2, and the hype was back on. 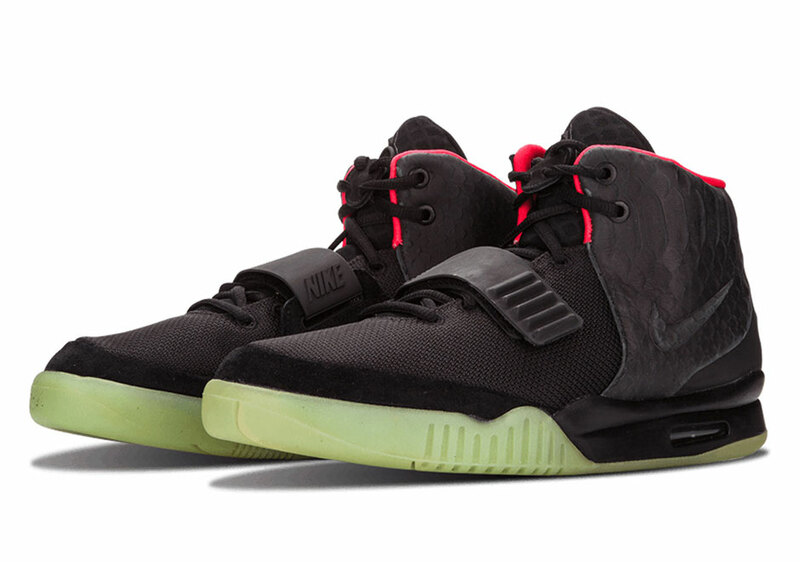 The Nike Air Yeezy 2 featured a sleek, refined design that shed some of the weight of its predecessor. The overall aesthetic was connected to the history of the first Yeezy, but this sequel swapped out the Air Jordan 3 outsole unit for one rooted in Nike’s tennis history with Andre Agassi’s Nike Air Tech Challenge II. 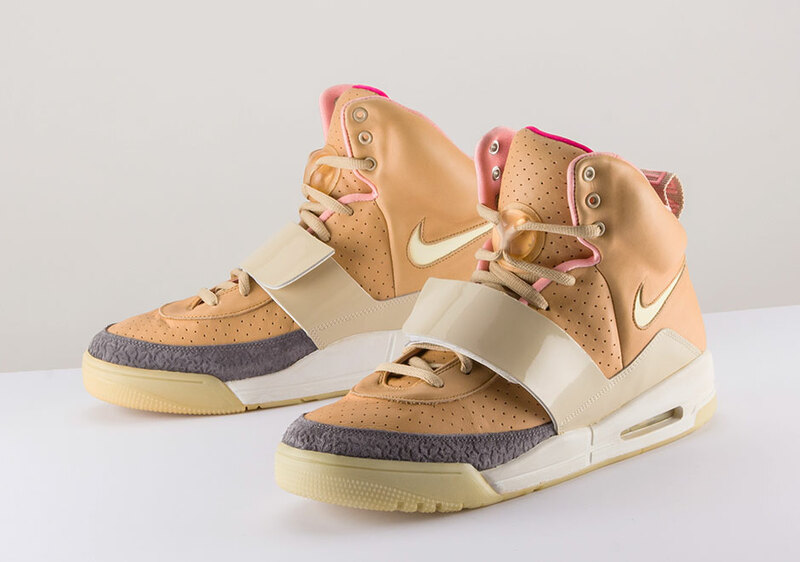 While the move to use that model might have brought other retros like the “Hot Lava” colorway back to prominence in following years, the Nike Air Yeezy 2 burst onto the scene with two original colorways on June 1st, 2009. 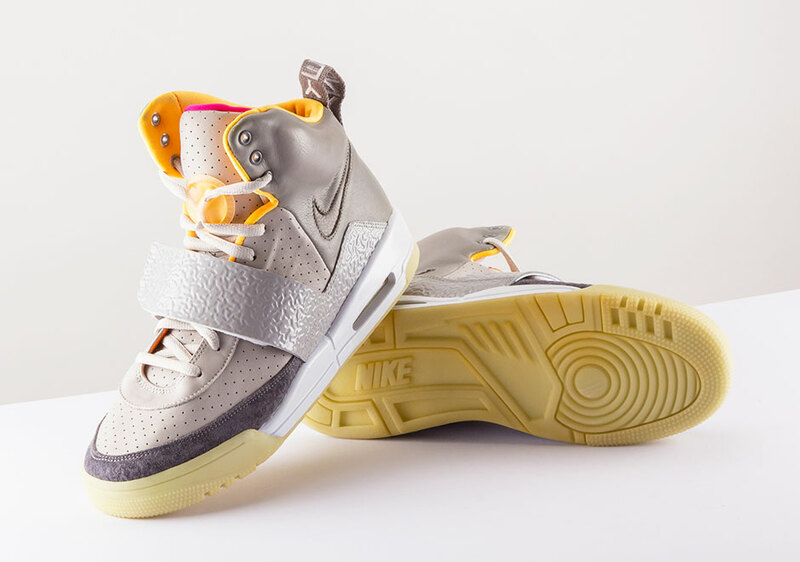 The Nike Air Yeezy 2 “Blink” featured faux-snakeskin on the ankle collar, an aggressive and futuristic ribbed heel, and a redesigned midfoot strap with hidden Egyptian Horus influences. Metallic Gold lacetips added to the exclusive appeal while a bolstered mesh and suede base did away with the original ‘Y’ Yeezy print. The glow-in-the-dark outsoles even stayed. 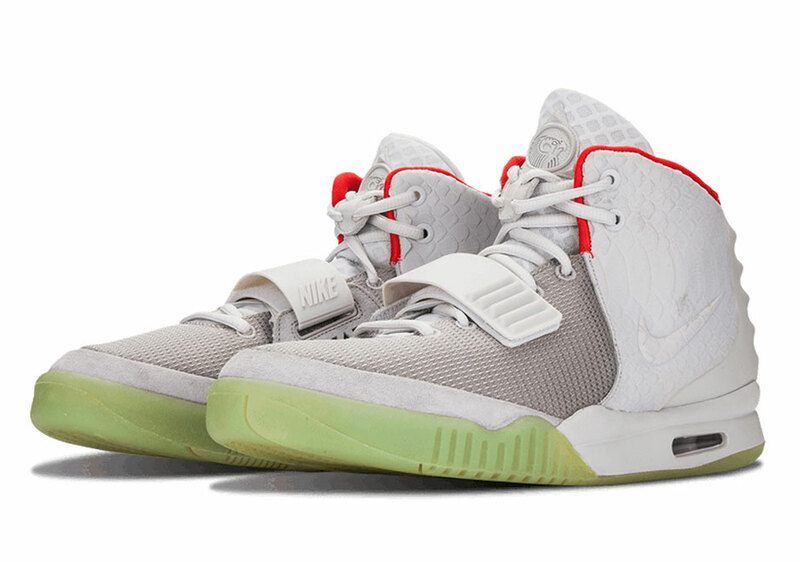 The Nike Air Yeezy 2 “Pure Platinum” was the refined version of the original “Zen Grey” aesthetic, with a lighter grey tooling proving to be even cleaner than the original. 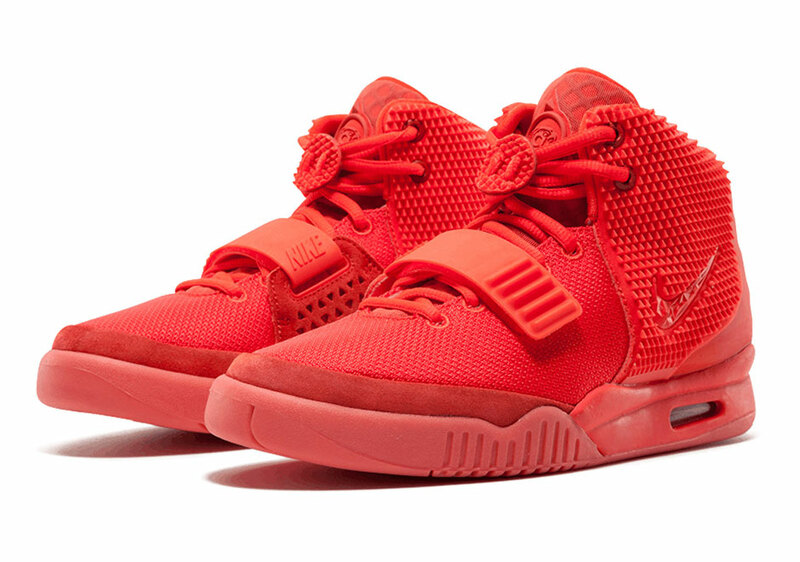 Fans of the model would have to wait until February of 2014 to get the real surprise, though: a shot at purchasing the often-rumored Nike Air Yeezy 2 “Red October”, the final collaboration between Nike and Kanye West before things turned sour between the two parties. Happy Valentine’s Day. Many sneakerheads were surprised that Kanye, a man who proclaimed that not only did his Nike Yeezy designs jump over the Jumpman in the past, but declared his own responsibility for the success and popularity of Air Jordan retro releases in popular culture today, switched over to the three stripes following a rather public contract dispute with Nike and Mark Parker. His inaugural adidas Yeezy Season 1 collection was as anticipated as any Yeezy release that preceded it 14 months after leaving the Swoosh. A trio of models were unveiled with the adidas Yeezy Boost 750, a suede high-top upper with a futuristic yet minimalist aesthetic with a midfoot strap and hidden Boost technology for an extra comfortable ride; the adidas Yeezy 350. 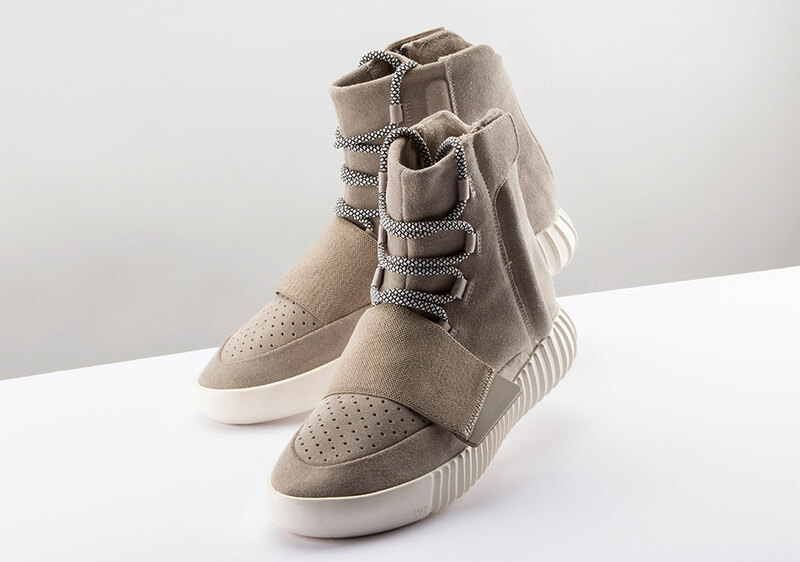 The adidas Yeezy Boost 750 was as sought after a Kanye model as any of the Nike Yeezy releases, but some people were put out by the limited release, its lack of athletic appeal (despite Kanye’s reassurance that you could hoop in a pair and Swaggy P proved that to be true months later in a game with the Lakers) and faulty Zippers that had many searching for different ways to lace up the model. 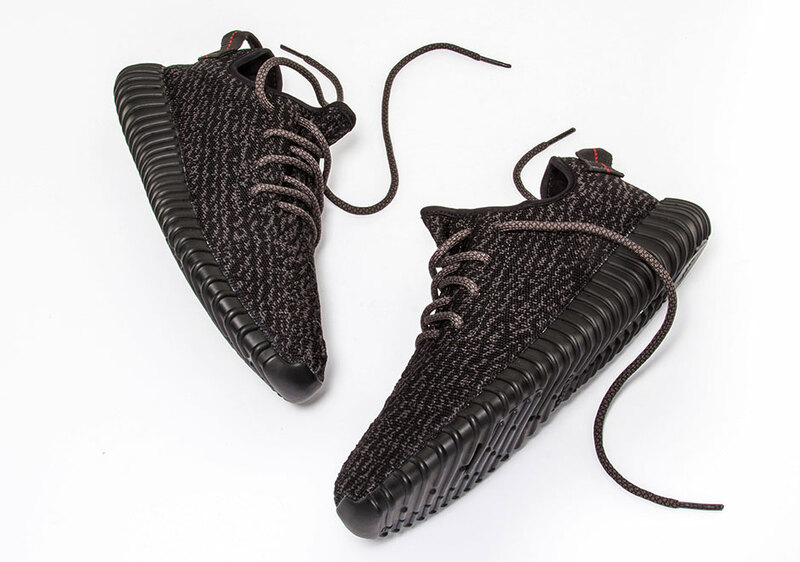 Yeezy Season 1 was primarily carried upon the strength of the woven low-top, the adidas Yeezy Boost 350. 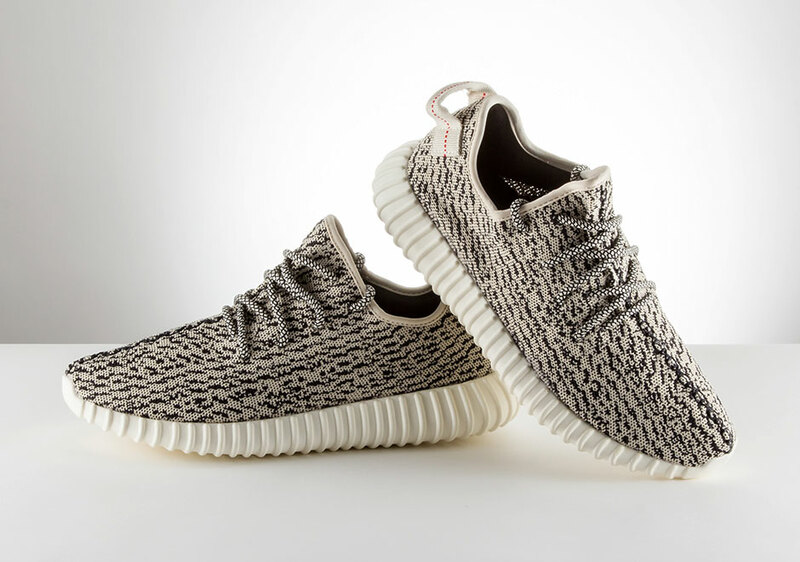 The adidas Yeezy Boost 350 Turtle Dove debuted on June 27, 2015 and featured a low-top slip-on construction with a bolstered Primeknit woven upper. The ambiguous speckled pattern would become a staple of the first season of Yeezy Boost 350 offerings while a leather medial panel featured ‘YZY’ embossed text so there was no doubting as to who designed the pair. Red accents on the heel tab and off-white hints throughout the Boost-covering midsole added a lifestyle vibe. 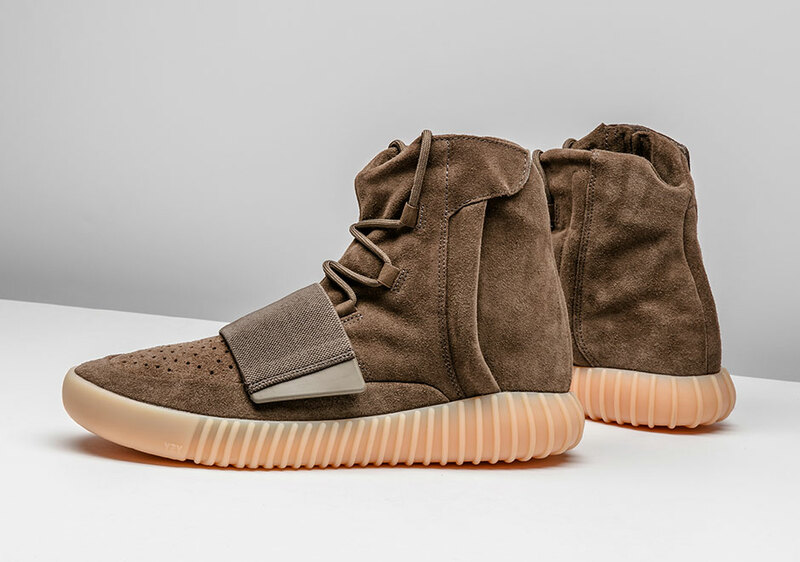 This pair was as coveted a pair as any in 2015 and proved that Kanye and adidas were a force to be reckoned with. Before adidas had released a “Triple Black” Ultra Boost with a colorized Boost unit, the adidas Yeezy Boost 350 Pirate Black relied on that TPU midsole cover to truly have an all-black-everything appearance. The main story there was that the three stripes hadn’t yet found a way to make the new midsole cushioning technology any other besides a clean white because cracking would happen regardless. 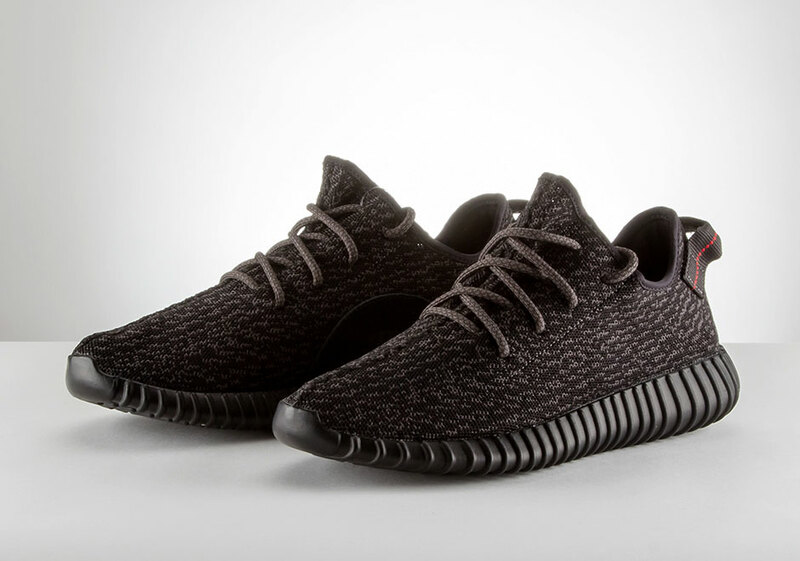 The adidas Yeezy Boost 350 Pirate Black burst onto the scene as one of the marquee end of summer releases in 2015 with the one-piece woven Primeknit upper still relying on that intricate strange striped pattern, just with darker touches of a deep black shade throughout. Red accent stitching still landed on the heel for the lone color pop. The shoe was praised for its simple design and sleek colorway and remains to be one of the more iconic of Kanye’s Yeezy collaborative efforts to date. 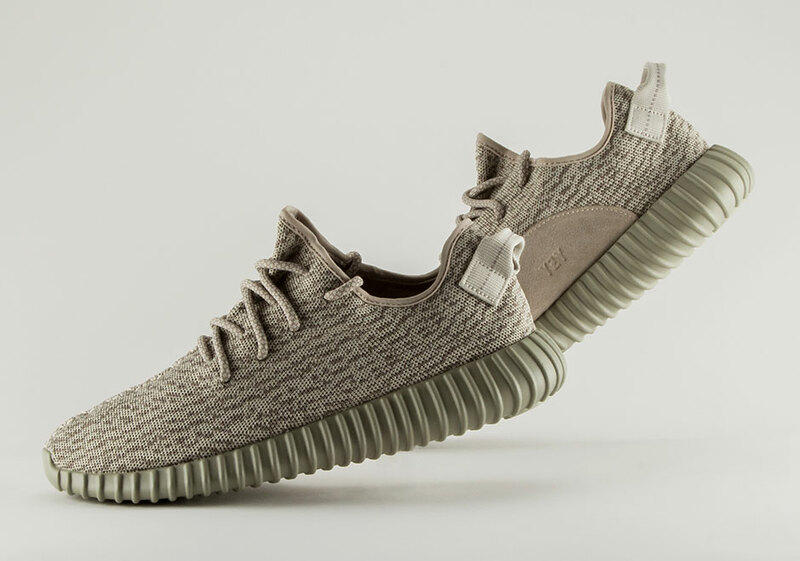 For the third colorway of the adidas Yeezy Boost 350, Kanye took the model to the moon with an all grey Primeknit woven upper that blended tonal shades of ‘Agagra’ and ‘Moonrock’ for a creation that matched the Lunar surface. People were still hunting down that August’s release of the Pirate Black pair once this creation dropped on November 14th, and the new grey midsole matched the heel tab’s complete lack of red stitching, a minor change when compared to the season’s other Yeezy Boost 350 releases. 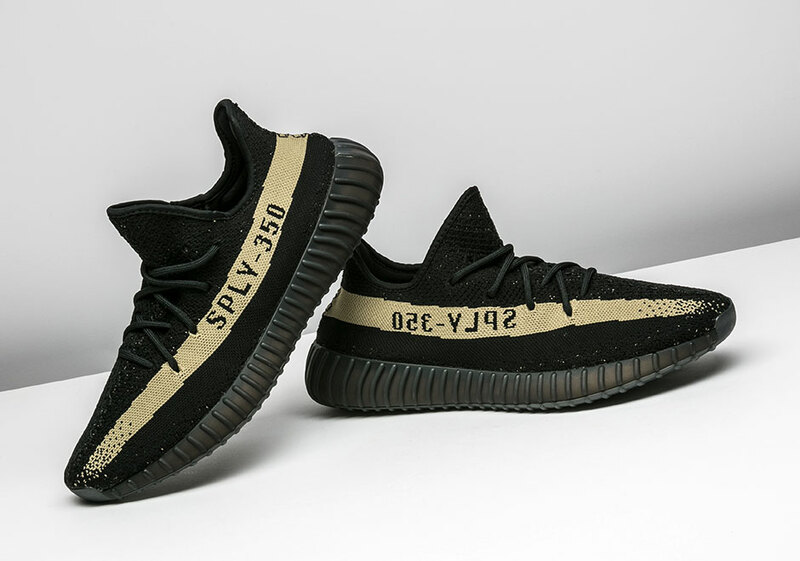 The adidas Yeezy Boost 350 had handled the last three releases of Kanye and adidas inaugural Season 1, that was until the three stripes released the adidas Yeezy Boost 750 “Black” to coincide with the looming Black Friday theme during the Holiday 2015 season. That premium suede upper proved to be the perfect textile to hold down the all-black-everything finish. The malfunctioning zipper issues had been fixed, and plenty of excitement resulted from a long gap from the last Yeezy Boost 750 release. Following colorways proved to be a little more on the experimental side, but this colorway was undoubtedly a solid selection of the luxurious Yeezy high-top. 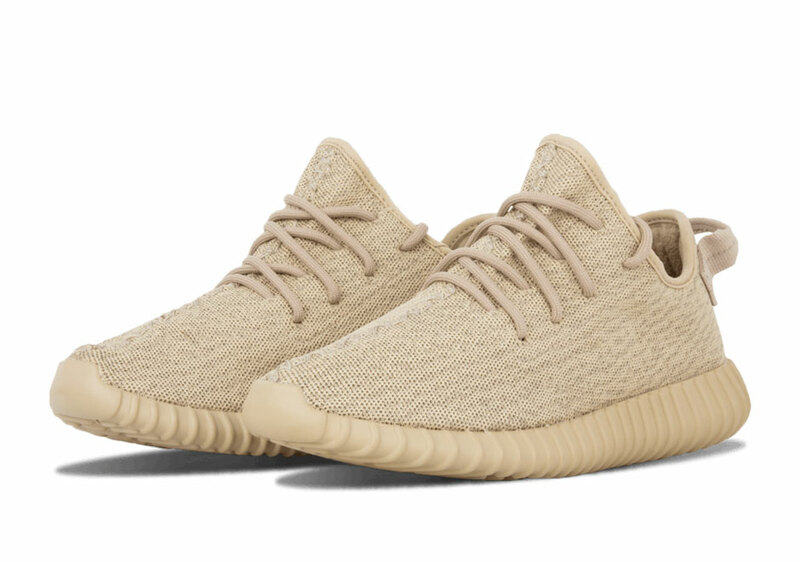 Kanye and adidas finished the year off strong with yet another adidas Yeezy Boost 350 colorway, this time utilizing a tonal “Oxford Tan” look that showcased Kanye’s love of the beige shade. You already saw similar tones in his Nike Yeezy “Net” option and his Louis Vuitton collaborations, but here the tan shade drew attention for its simplicity. A new suede accent appeared on the side panel as a slight deviation from the norm. 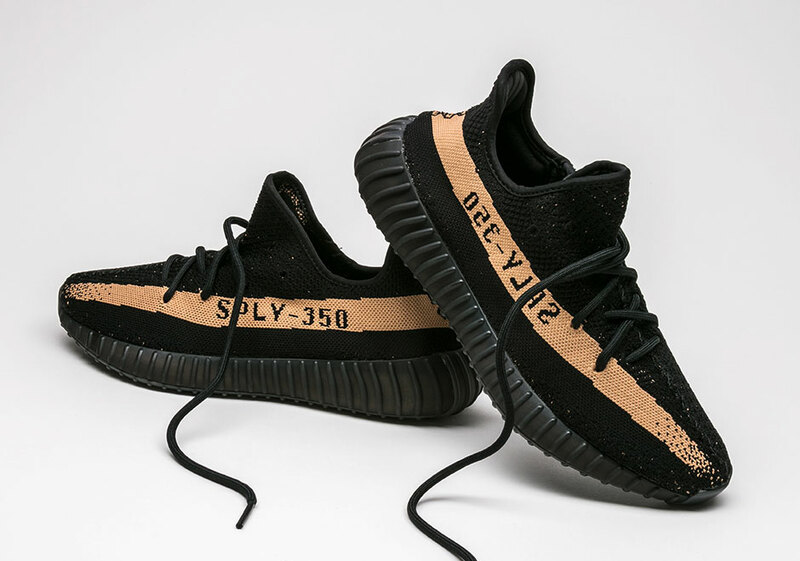 The adidas Yeezy Boost 350 Pirate Back was undoubtedly the fan-favorite for the Yeezy Season 1 footwear collection, so when adidas decided to release it again in a surprise move on February 19, 2016, excitement followed. The three stripes made some minor changes to the Pirate Black 2.0 as the Primeknit was changed slightly, while additional heel padding helped increase this rendition’s support. The Boost midsole cushioning system was as comfortable as ever with the TPU enclosure once again getting a jet black finish. The only color highlight was the vibrant red stitching on the heel tab. 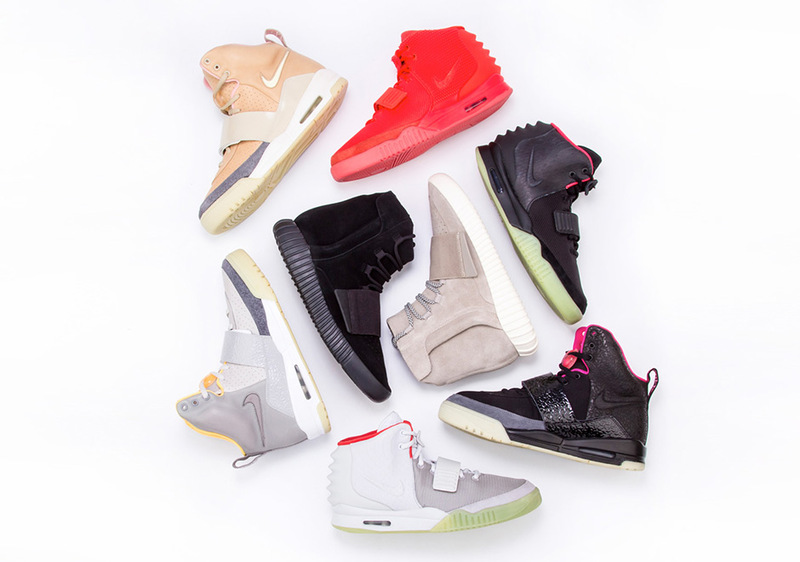 Kanye’s initial Nike creations came at one of his career’s most successful times. The Glow In The Dark Tour showed just how much of a performer Kanye was, and his new Nike Yeezy silhouette was garnering interest for its Air Tech Challenge II referencing midsole that glowed in the dark. 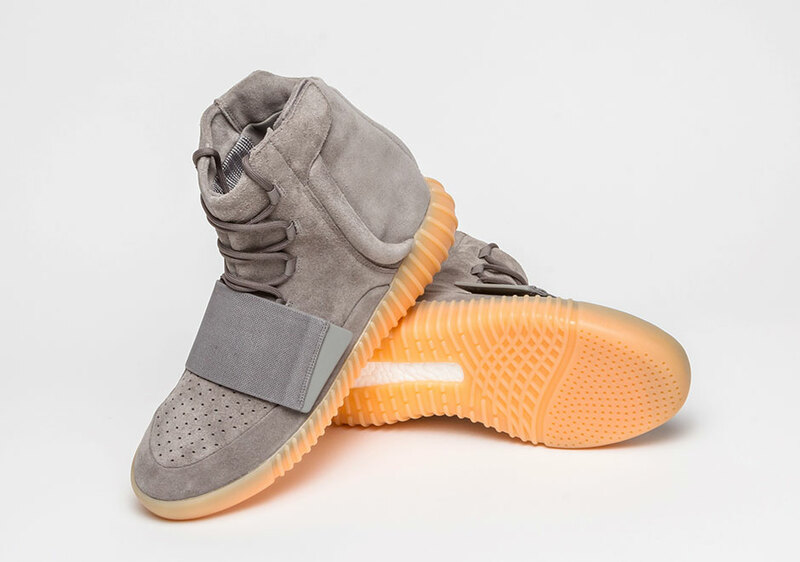 Kanye vowed to never go back to the Red October’s monochromatic red colorway when he signed with adidas, but he managed to get the glow-in-the-dark feature approved with this adidas Yeezy Boost 750 “Light Grey/Gum”. On the surface, this light grey suede upper was comparable to the first colorway to ever release, but the addition of the gum outsole livened thinks up, especially with the hidden glow feature. 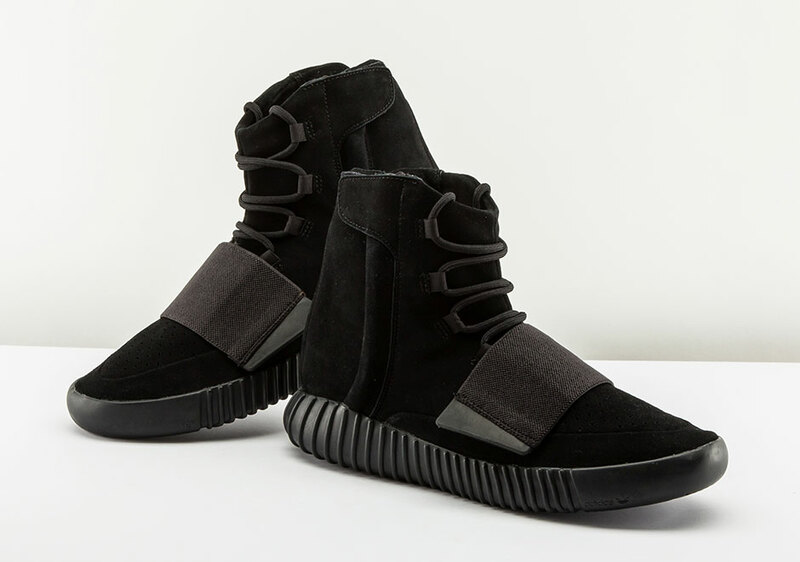 The June 11th release has since been one of the outliers in a long list of Yeezy must-haves. Perhaps it was the fact that Kanye wanted daughter North to not be the only fresh kid on the planet or it was the urging of his wife Kim, but the adidas Yeezy Boost 350 was finally made in infant and toddler size runs on August 27th, 2016 in the first Turtle Dove and popular Triple Black colorway. While the $130 USD might have seemed like a steep price to pay, the resale market dictated the lengths that streetwear savvy parents would go to lace up their kids in matching pairs. The sneaker even made appropriate Primeknit and Boost technologies to scale. Kanye’s first year with adidas had gone better than anyone could have predicted. Not only had the adidas Originals and Running lines been revamped by the coveted combination of Primeknit and Boost, but with Kanye’s unique design eye and following, the three stripes was as relevant as ever in both the performance and streetwear worlds. September proved to be the perfect time for adidas to introduce the freshly revamped adidas Yeezy Boost 350 V2 silhouette with an extended mid-top height, an altered heel with no tab, and a head-turning new Primeknit construction that featured wavy patterns on the medial side with a new side panel stripe that read SPLY-350 on a vibrant dose of Solar Red. The Boost midsole unit was also changed, although not as drastically as the upper. The protective cage was now semi-translucent for an interesting aesthetic to match. adidas returned to the adidas Yeezy Boost 750 silhouette for the last time with the most fall-ready colorway they could muster up. The smooth lifestyle-grade suede construction worked well with the Chocolate Brown shade throughout. And although early samples showcased the Gum bottom with the glow-in-the-dark feature that the Light Grey pair utilized, retail pairs didn’t come equipped with that additional glow after all. 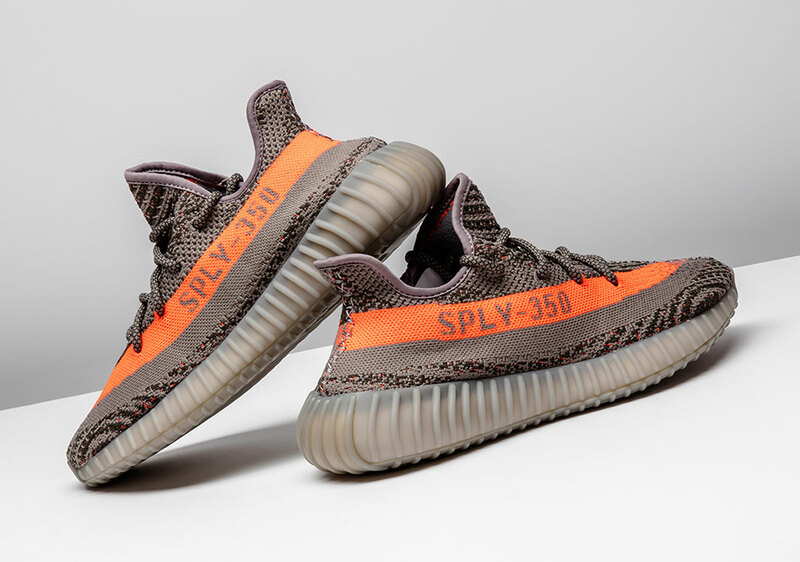 The adidas Yeezy Boost 350 V2 started off on the right foot with the “Beluga” colorway. The muted tones of the Primeknit base was interrupted by a jarring contrast of Solar Red on the side panel, and what would follow were three other colorways based in a Core Black Primeknit, each with their own accent shade to mix things up. 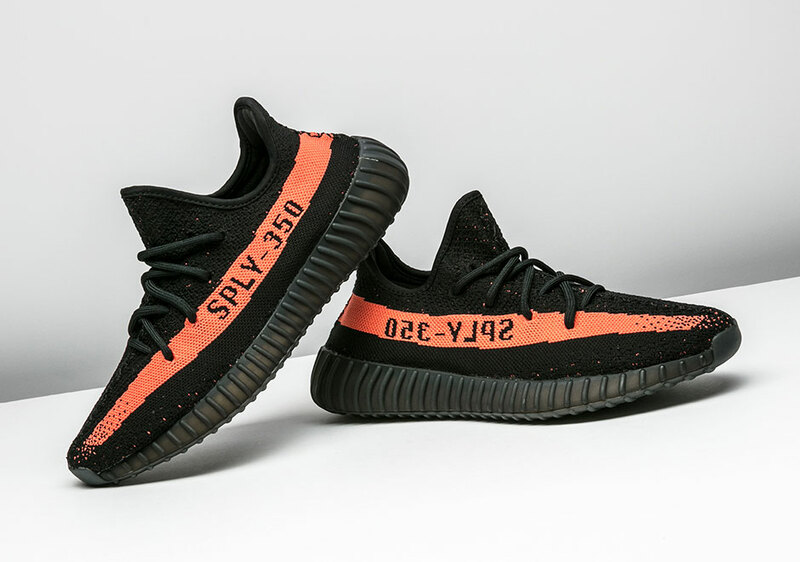 The SPLY-350 text returned on each pair, as the side panel stripes ranged from Solar Red, Green, and Copper. Each pair was readily available on November 23rd, 2016, and these wouldn’t be the last 350 Boost pairs to release at retail before the year’s end either. 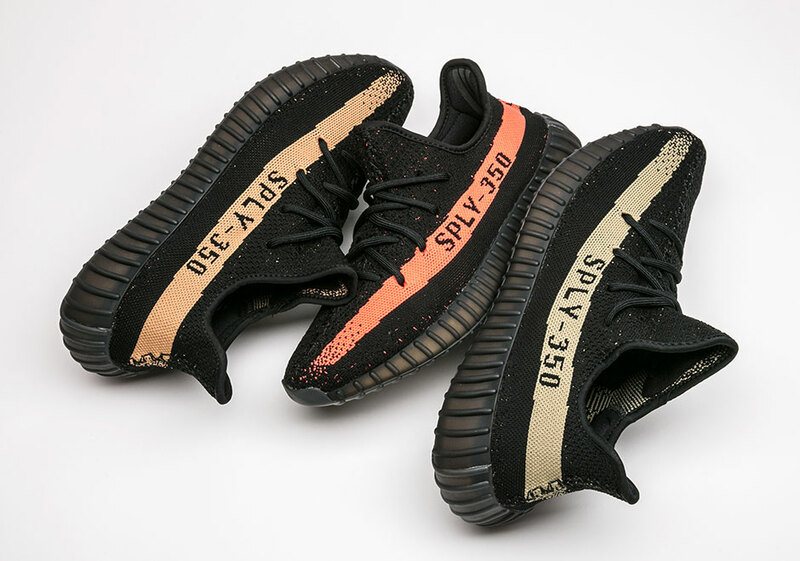 The last adidas Yeezy Boost 350 V2 release of the year kept things relatively simple when compared to the vibrantly colored counterparts. 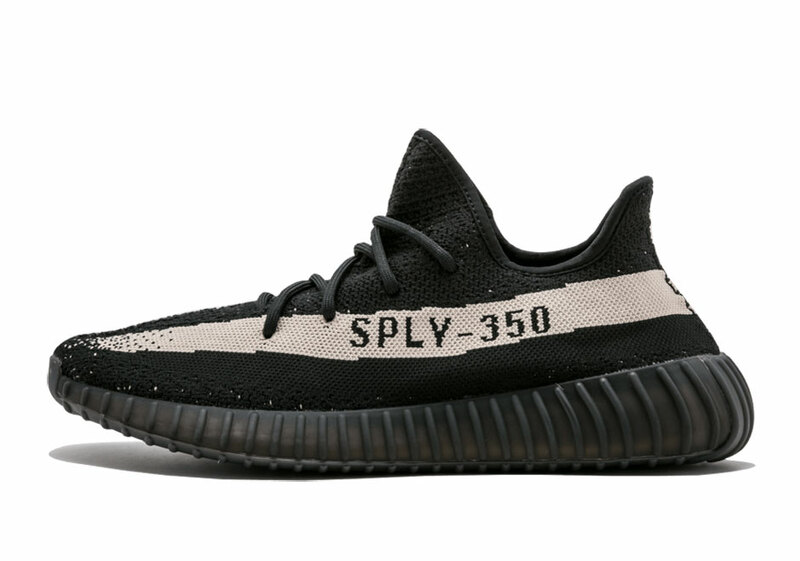 While a trio of releases highlighted the November release slate, the adidas Yeezy Boost 350 V2 “Black/White” showcased the elegant simplicity of the most popular Kanye silhouette. The Primeknit was refined and revamped in an all black appearance while a streak of white highlighted the SPLY-350 trademark on the side. The white rendition was more off-white in nature than initially expected, and people flocked to grab this pair for the Holiday 2016 season.